Dr. Steve Meyer joined Kerns and Associates in January 2018 after serving as Vice President – Pork Analysis at EMI Analytics since May 2015. Dr. Meyer’s duties at Kerns and Associates include ongoing analysis of hog and pork markets and assisting Kerns clients (which now include the National Pork Board and National Pork Producers Council) in using his insights to successfully manage their businesses. He brings a wealth of experience in the livestock industry. His breadth of work in the pork industry is unique. Prior to his time at EMI Analytics, Dr. Meyer was President of Paragon Economics, Inc. where he also monitored and analyzed cattle, beef and poultry markets to meet the needs of his diverse set of clients. He served for 12 years as an author of The Daily Livestock Report sponsored by CME Group, an e-newsletter whose circulation grew steadily following its introduction in 2003. In addition, he writes a feature article for National Hog Farmer’s Weekly Preview e-letter that focuses on economic issues in North America’s swine/pork sector. Prior to founding Paragon Economics, Dr. Meyer served as Director of Economics for the National Pork Producers Council and National Pork Board from 1993 to 2002. Guelph, is an independent Canadian agricultural economist and operates his own firm, Agri-Food Economic Systems. His areas of research expertise are farm management, agricultural marketing, and farm income policies. He also teaches finance and marketing to participants in the Centre's executive management programs. Al holds Bachelors and Masters Degrees in agricultural economics from the University of Guelph, and a Doctorate in agricultural economics from the University of Minnesota, where he was a Fulbright Scholar. Bob Hunsberger received a B.Sc. from the University of Guelph in 1968. That year he began farming on the family farm with his father. The farm consisted of hogs, laying hens and crops. In 1985 the farm specialized as a hog operation, growing to 1500 sows farrow to finish on three locations. 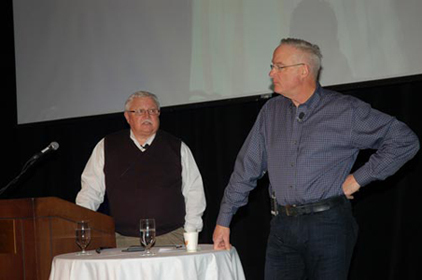 In 1994 Bob became one of the founding directors of Progressive Pork Producers Co-Operative Inc. That company purchased Conestoga Meat Packers in 2001. The company processes pigs supplied by Co-op members. In 1998 Bob began working on a contractual basis in swine feed sales and service with Wallenstein Feed & Supply Ltd. Bob continues to operate a small hog finishing unit on his home farm near Breslau. He continues to have an interest in the economics of agriculture, particularly hog production. He publishes a weekly summary of the economics of hog production in Ontario. Guelph, Ontario, served as Executive Director of the Ontario Cattlemen's Association (now Beef Farmers of Ontario) for 31 years retiring in 2001. Since then, he has worked on a part time basis in a number of roles including Chair of Board of Directors of Canadian Beef Grading Agency and Secretary Treasurer of the Ontario Agricultural Commodity Council. He has been an associate with the George Morris Centre on beef production and risk management issues and has worked with the Ontario Cattle Feeders Association on risk management issues. Edmonton, has over 30 years experience as a management consultant in the agri-food industry. As a founder and senior partner with Toma & Bouma Management Consultants, he has managed more than 500 strategic planning and marketing projects. Prior to establishing Toma & Bouma in 1992, he worked as the Senior Marketing Manager with Shur-Gain Feeds - a division of Maple Leaf Foods; and as a management consultant with Deloitte Haskins + Sells - now Deloitte Touche. is known and respected in the agriculture and food industries across Canada for his knowledge, insights and decision making capacities particularly in the areas of supply management and agricultural marketing. He has owned and managed firms in the hog, turkey, dairy and egg industries over the past thirty years. Today George serves as Chair for five agri-food companies in BC in the egg, dairy, bakery ingredient, snack food and potato sectors. George lives on the west (or left) coast where he and his wife Kelly operate a small orchard and market garden. Eastend, Sask, is a Market Analyst for Gateway Livestock Exchange based in Taber, Alberta. She is also the President of Cattle Trends Inc, a market analysis company for the beef industry. Prior to joining Gateway Livestock Exchange, Wasko was the Senior Market Analyst for Canfax, a division of the Canadian Cattlemen's Association, for 21 years providing members with market information and analysis. Wasko was also a volunteer with the Calgary Stampede for over 20 years and sat on the Statistics Canada Advisory Committee for Agriculture. Drummondville (Central Quebec), provides, training and counselling on many aspects of animal welfare with a focus on animal handling and transport. Certified trainer of the Canadian Livestock Transport (CLT) Certification program (Canada), Stephane was trained as a Six Sigma Black Belt in process improvement and change management with Maple Leaf. He was a market access specialist for a leading Canadian animal health firm. His personal mission is to promote the humane treatment of animals via education and certification.